It’s now the third season for the tractor, so now’s a good time to look back and see what we’ve learned, and what improvements could be made. After the conversion, we had one issue with one of the tooth belt pulleys, but a local machinist did the repair, and other than tire pressures and two quarts of oil in the hydraulics, it’s been running just fine. Electrical-wise, there have been no issues. The batteries were replaced at the beginning of this year, and we changed from sealed lead-acid batteries to flooded lead-acid batteries. We just couldn’t justify the cost of new sealed lead-acid batteries when flooded lead acids would do the same job, if we just keep an eye on the water level. The flooded batteries are also a little more forgiving when it comes to overcharging to balance the battery pack. For this application, I wouldn’t use anything but lead-acid batteries. You want the weight, it’s a low power draw, and you’re only one field away from the plug at any time. We wanted reliability, so when we first started to rebuild the tractor, we went through everything! New brakes, oil seals, steering bushings, tires, all new bolts with nylon locking nuts. Only a few old specialty bolts were reused, and those were at least cleaned and oiled before being reinstalled. The cultivator rides under the tractor, and for the last two years, that’s been the tractor’s only job. This year a rear hydraulic hitch was added, which can lift the farm’s 3-row planter (photo of rear hitch and planter coming soon). Now the tractor will really earns it’s keep since it can do the majority of the planting and cultivating on the farm. The other big addition was a new Outback inverter . 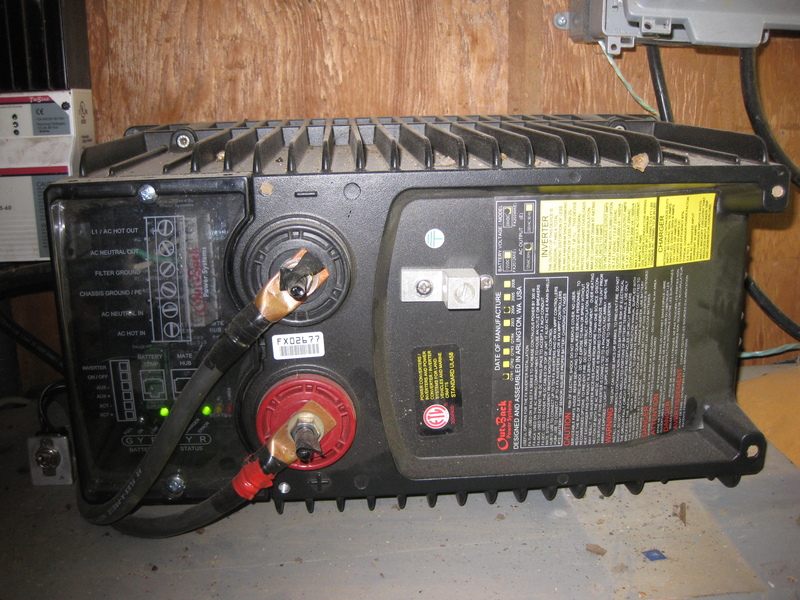 The inverter takes the 24 volt DC power from the solar panels and battery pack in the barn and converts it to 120 volt power to charge the tractor. The old unit just wasn’t robust enough for daily use or extreme temperatures, and the new unit is designed for just that. When the tractor ran on gasoline, and if gasoline was $4.00, it cost approximately $3.50 an hour to operate, not counting oil changes, tune ups, etc. Now the tractor runs for free, and with the extra power not used by the tractor, the barn electric bill was lowered by $10 a month during the summer. With a bigger battery pack in the barn, I’d like to see the barn run for free as well.